What are causes and risk factors for cystic acne? What are cystic acne symptoms and signs? How do health-care professionals diagnose cystic acne? Are there home remedies for cystic acne? What are treatments and medications for cystic acne? What are possible complications of cystic acne? What is the prognosis of cystic acne? Is it possible to prevent cystic acne? Cystic acne is a form of acne associated with long-standing, painful nodules of the face, back of neck, chest, and back. Adolescent acne goes through certain stages, each of which requires specific therapy. It starts with closed comedos (whiteheads), which may progress to open comedos (blackheads). Unless they are picked, popped, and manipulated, these would only rarely cause scarring. Some of these will progress to what is recognized as acne and, in turn, some of those into pustular acne. Pustules are more likely to scar, especially if they are "popped." Cystic acne is the final stage of progression of acne and left untreated is a significant source of acne scarring. As these are space-occupying collections of inflammatory material, scarring is predictable. Cystic acne may involve the face, chest, back, or unique combinations of these. Cystic acne may also be part of a syndrome that involves some combination of acne on the face with draining lesions and boils of the scalp (dissecting cellulitis of the scalp), axilla (hidradenitis suppurativa), groin, or chest. Conglobate acne is a severe form that may present as a severe cystic acne of the face and trunk, which can also have systemic manifestations such as arthritis and other musculoskeletal problems. 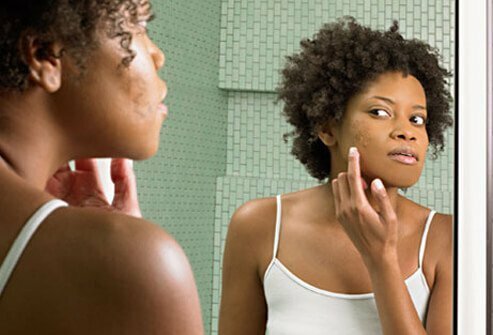 Perioral dermatitis is an acne-like problem that usually affects young women and causes small papules on the chin, around the mouth, and along the jawline. Some of these papules may be deep-seated, but this usually does not cause the large, scarring nodules and cysts of true acne. There is a trend that if a parent or older sibling had significant scarring acne, you are more likely to develop it yourself. However, a family history of cystic acne is not universal, even in the most severe cases. Elevations in testosterone, either intrinsic to the body or extrinsic through the intake of anabolic steroids, may precipitate or worsen cystic acne. While most combination contraceptive pills will have a therapeutic benefit in acne, the progesterone-predominant contraceptive types such as progesterone-only mini-pills, progesterone implants, and progesterone-eluting intrauterine devices may worsen acne, although these may serve as effective contraception when isotretinoin use for acne is considered. Cystic acne is characterized by long-standing, painful nodules of the face, back of neck, chest, and back. The nose may be spared or significantly involved with pustules and nodules. When these nodules finally recede, they usually leave behind scars. Individual scars may be the classic acne "ice pick" scars, but many of these aggregated together cause a more vermiculate or "worm eaten" scarring. This is especially likely on to occur on the cheeks. While starting as pus-filled pimples, these evolve to inflammatory red papules (bumps) and eventually once treated or in remission may settle down to pink spots. Cystic acne is usually diagnosed by its clinical appearance. Even if there are no active inflammatory nodules, pink scars may remain. Skin biopsy is not necessary unless it is suspected that the patient may actually have a folliculitis caused by yeast or a condition called eosinophilic folliculitis. Bacterial culture is rarely helpful as patients may respond to antibiotics to which they show resistance and not respond to antibiotics to which they show sensitivity. A variety of home remedies such as baking soda, various masks, apple cider vinegar, and tea tree oil have been recommended for cystic acne, and often one may find testimonials for these remedies online, especially on the web sites selling these supplements or alternative therapies. When put to scientific challenge, they are usually found to be ineffective and may only delay diagnosis and effective treatment. Vitamin A orally or by injection has been used for acne with variable effects. Because isotretinoin is a vitamin A analog, extra vitamin A should not be taken while taking this drug because of the increased risk of vitamin A toxicity. Biotin, a vitamin cofactor, is necessary for healthy hair, skin, and nails, but any beneficial effects on severe cystic acne will be limited, especially if vitamin supplements are the sole therapy. Diet may contribute to cystic acne as it may to other acne varieties. Rather than the "greasy food and chocolate" on which many blame their acne, it appears that milk, especially skim milk, worsens acne when not taken in moderation. Foods with a high glycemic index (that rapidly raise blood sugar) also are associated with acne flares. Other milk by-products, such as whey protein supplements, may worsen acne. Many patients who feel "sweating at the gym" is making their acne worse after working out should instead blame the protein shakes they consume after exercise. There is no good data at this time for the role that soy or almond milk may play in acne. Although the mechanism is not clear, smoking may worsen acne of all types and is, in fact, one of the three primary risk factors for hidradenitis suppurativa. Most studies have examined cigarette smoking with the effect of cigars, smokeless tobacco, nicotine patches, and "vaped" nicotine not being as well-defined. Over-the-counter (OTC) medications, usually containing salicylic acid and/or benzoyl peroxide, and topical prescription medications have much less a role in the treatment of severe cystic acne than they do in milder acne. Topical acne medications like azelaic acid (Finacea, Azelex), dapsone (Aczone), benzoyl peroxide (BPO) combined with clindamycin (BenzaClin, Duac), BPO and erythromycin (Benzamycin), or BPO and adapalene (Epiduo), would generally not be effective until the deeper cystic acne component is under sustained control. Likewise, the clindamycin/tretinoin combinations like Ziana or Veltin may have more utility in maintenance once the worst of the cystic acne is controlled than in gaining initial control of moderate to severe acne. The same applies to topical antibiotics without benzoyl peroxide such as clindamycin (Cleocin, Clindamax). Other topical antibiotics such as mupirocin (Bactroban), bacitracin and topical sulfacetamide/sulfa drugs (Rosanil) have no role in the management of acute cystic acne. Topical retinoids such as tretinoin (Retin-A, Retin-A Micro) and adapalene (Differin) may still be used for any remaining pimples and also for their long-term beneficial effects in scar renovation. Topical tazarotene (Tazorac) may be more effective in the treatment of severe acne but also much more irritating. Topical retinoids should usually be discontinued while oral retinoids are used because of increased skin dryness. While hormonal therapies, especially the start of combination oral contraception, may sometimes yield rapid benefits on their own, most patients with cystic acne will require some sort of combination therapy that includes oral antibiotics. The usual combinations of estradiol with levonorgestrel, norgestimate or norethindrone (Levonest, Angeliq, Activella, Ortho Tri-Cyclen, Trinessa, Prefest) are usually well tolerated, especially in younger patients. Those oral contraceptives that use drospirenone as the progesterone component (Yasmin, Yaz, Ocella) may be especially useful in some patients but should not be combined with spironolactone discussed below because of a risk of high potassium levels (hyperkalemia). There have been past reports of decreased contraceptive effectiveness if the patient is also on a tetracycline medication, a common combination for cystic acne, but review of the literature supports that while this may occur occasionally, it is actually quite uncommon. That being said, any patient whose previously regular periods change once a tetracycline medication has been started should take additional precautions to avoid pregnancy. As this is not a simple infection, treatment duration is on the order of months rather than weeks, and the antibiotics such as those in the tetracycline family that have anti-inflammatory properties beyond their antibacterial properties are the usual first choice. A variety of antibiotics have proven useful in cystic acne. All members of the tetracycline family (tetracycline [Diabecline], doxycycline, minocycline [Minocin], demeclocycline) may work and are usually the first medications prescribed. The sustained-released formulations of these medications (Solodyn, Oracea) may be helpful but usually more for maintenance than for acute flares. Trimethoprim-sulfamethoxazole (Bactrim, Septra) is often the next class of medication tried. Clindamycin (Cleocin) may be used on its own or combined with rifampin (Rifampicin). Erythromycin (Ery-tab) has a long history of use in acne, but gastrointestinal upset may limit its use. Azithromycin (Zithromax) may be used, but after an initial loading period, it is best used every other day because of the long half-life. Any medication may cause any drug reaction, but there are some more specific reactions associated with certain classes of medications. Minocycline may have a higher risk of hyperpigmentation and drug hypersensitivity syndromes. The relative risk of severe side effects such as Stevens-Johnson syndrome or toxic epidermal necrolysis may be somewhat higher in people taking trimethoprim-sulfamethoxazole than other antibiotics. Likewise any antibiotic may cause the intestinal problem known as pseudomembranous colitis, but clindamycin is more strongly associated with this condition. Spironolactone (Aldactone) is a diuretic with anti-androgen properties. It is used often in older women for whom oral contraceptives have additional medical risks. It has been shown to help relieve acne, especially when used together with an antibiotic. If taken during pregnancy, it may cause genital problems in the male fetus and, for that reason, should not be used in someone pregnant or planning pregnancy. It is a potassium-sparing diuretic drug, so people taking this medication should take additional potassium supplementation. Hormonal therapy is not used in males as the doses needed to suppress the acne would usually cause feminization problems such as gynecomastia and possible sexual dysfunction. Oral corticosteroids (Prednisone, Solu-Medrol): Acne may be caused by systemic steroid use, but "steroid acne" is usually characterized by an acute eruption of tiny papules and pustules over the chest and back. Oral steroids may play a role in the treatment of cystic acne, not on their own, but as an adjunct to other antibiotic or isotretinoin therapy to try to suppress scarring inflammation in the skin as fast as possible. This may be especially important with the initiation of isotretinoin therapy, and many providers will start low-dose systemic steroids at the start of isotretinoin therapy in order to block the anticipated flare in disease that retinoids may trigger. Narrowband UVB ultraviolet light phototherapy and photodynamic therapy are two physical methods that have been used in cystic acne. Because of limits of skin penetration, this may not work as well with large deep cysts but may be useful in addition to ongoing antibiotic therapy. While there are concerns about long-term sun damage in patients who try to manage their conditions such as acne, psoriasis, or eczema with natural sunlight, many patients may show improvement with careful sun exposures. Special care must be taken if a patient is on a sun-sensitizing antibiotic, such as a tetracycline product as they may become prone to severe sunburn. Patients with cystic acne who do not respond to the therapies above will need to consider isotretinoin (Amnesteem, Claravis, Absorica, Isotroin, Epuris), known most commonly as Accutane, although technically there is nothing branded "Accutane" still marketed in the U.S. This should not be considered an absolutely last resort, after everything else has been tried and failed. That being said, because of the side effects and the inconvenience of the prescribing regulations, it is prudent to see if the acne will respond to at least a reasonable try of other therapy before moving to isotretinoin. Universal side effects of isotretinoin include dry lips, dry eyes, and dry nose. Lab monitoring for elevated triglycerides and liver function tests is recommended during the course of therapy. Depression is an uncommon side effect but one of the more serious. Treatment duration may be based on total dose per kilogram or on a planned 20 weeks at 1 mg/kg/day. Isotretinoin should not be used at the same time as tetracycline products. Other antibiotics and/or oral steroids may be used to manage acne flares early in the treatment course. All patients receiving isotretinoin in the United States must be enrolled in the iPledge program to receive their medication. The physician and dispensing pharmacy must likewise be enrolled in the program. There are different requirements for males and fertile women. All must be seen and cleared on the program monthly. Refillable prescriptions are prohibited. Potentially fertile women must have a negative pregnancy test a month before starting the medication and monthly tests throughout the treatment (and a final post treatment pregnancy test is recommended). If used during pregnancy, isotretinoin can cause serious birth defects. While cellulitis and deep space infections have occurred as complications of cystic acne, they are relatively rare, and the primary concern is scarring. Despite all the current therapies to manage old acne scars, the best treatment of scars is to prevent them in the first place. Other than scarring, the primary medical risk of cystic acne is an unexpected complication of therapy. Any medication may cause drug rashes from less serious nuisance rashes to a life-threatening form of skin damage known as toxic epidermal necrolysis. Isotretinoin risks have already been discussed above, but some feel there is an increased risk of later inflammatory bowel disease from isotretinoin therapy, antibiotic therapy, or the combination of the two. Immediate resolution of the acne, even with the best and most effective treatments, is unlikely. The skin cells have a six-week life cycle, and it usually takes a number of weeks before optimal results may be reached. The prognosis for eventual control is good, although there will always be some remaining scarring long after the condition has been treated or gone into remission. The best way to prevent cystic acne is to avoid inciting medications and treat acne effectively at earlier stages before the larger, scarring cysts and nodules are evident. Excessive milk intake and smoking should be avoided. Aslam, I., A. Fleischer, and S. Feldman. "Emerging Drugs for the Treatment of Acne." Expert Opin Emerg Drugs 20.1 (2015): 91-101. Culp, L., S. Moradi Tuchayi, H. Alinia, and S.R. Feldman. "Tolerability of Topical Retinoids: Are There Clinically Meaningful Differences Among Topical Retinoids?" J Cutan Med Surg 19.6 (2015): 530-538. Das, S., and R.V. Reynolds. "Recent Advances in Acne Pathogenesis: Implications for Therapy." Am J Clin Dermatol 15.6 (2014): 479-488. Marqueling, A.L., and L.T. Zane. "Depression and Suicidal Behavior in Acne Patients Treated With Isotretinoin: A Systematic Review." Semin Cutan Med Surg 26.4 (2007): 210-220. Melnick, S. "Cystic Acne Improved by Photodynamic Therapy With Short-Contact 5-Aminolevulinic Acid and Sequential Combination of Intense Pulsed Light and Blue Light Activation." J Drugs Dermatol 4.6 (2005): 742-745. On, S.C., and J. Zeichner. "Isotretinoin Updates." Dermatol Ther 26.5 (2013): 377-389. Rassai, S., E. Rafeie, M.K. Ramirez-Fort, and A. Feily. "Adjuvant Narrow Band UVB Improves the Efficacy of Oral Azithromycin for the Treatment of Moderate to Severe Inflammatory Acne." J Cutan Aesthet Surg 7.3 (2014): 151-154. Stein Gold, L. "Topical Treatments in Acne Vulgaris: Guidance for the Busy Dermatologist." J Drugs Dermatol 14.6 (2015): 567-572. Tyler, K.H. "Dermatologic Therapy in Pregnancy." Clin Obstet Bynecol 58.1 (2015): 112-118. What is the best acne treatment? Learn how to get rid of pimples fast, home remedies for pimples, how to get rid of acne scars, types of pimples, back acne, and body acne. Share your experience with cystic acne. What treatments have helped your cystic acne? Have any home remedies helped your cystic acne? What is the best treatment for acne vulgaris? Can food choices influence acne? How can you get rid of blackheads? Learn why it's a bad idea to pop pimples, how pimples form on the face, arms, chest, back, and legs, and what to do with painful cysts, ice pick scars, and acne mechanica. Acne (pimples) is a skin condition that blocks pores. Get answers on causes, solutions and treatments for this skin condition that can still be a problem in adults. Anabolic steroids are synthetic substances that are related to testosterone and promote skeletal muscle growth and the development of male sexual characteristics in both men and women. In the 1930s, it was discovered that anabolic steroids could promote skeletal muscle growth in lab animals, which lead to anabolic steroid abuse by bodybuilders and weight lifters. serious skin and soft tissue infections. Side effects, dosage, drug interactions, and pregnancy and breastfeeding safety should be reviewed prior to taking this medication. Cystic acne is a type of abscess that is formed when oil ducts become clogged and infected. See a picture of Cystic Acne and learn more about the health topic. Erythromycin (Ery-Tab, PCE) is an antibiotic prescribed to treat a variety of infections. Side effects, drug interactions, dosage, storage, and pregnancy safety information should be reviewed prior to taking this medication. Mupirocin (generic) Bactroban Nasal, Centany (brands) is an antibiotic that is used topically for the treatment of impetigo, MRSA, and staph infections. The nasal spray may be prescribed for individuals that come into contact with patients infected with MRSA, or other infectious diseases. Drug interactions and side effects should be reviewed prior to taking this mupirocin. Bactroban has been discontinued in the US. Pimples are areas of skin inflammation with pus in the center. Cold sores are fluid-filled blisters. Pimples are caused by bacterial overgrowth and inflammation. Cold sores are caused by infection with herpes simplex viruses (HSV-1 and HSV-2). Benzoyl peroxide and sometimes antibiotics treat acne. Antiviral medications accelerate the healing process of oral herpes. Can what you eat cause a breakout -- or clear up your skin? Find out more about how some foods can affect your acne. Boils result from a localized skin infection. They start as a hard, tender lump that reddens. Eventually, the lump becomes filled with whitish or yellow pus, which comprises millions of dead white blood cells the body has deployed to fight the infection, bacteria, and proteins.